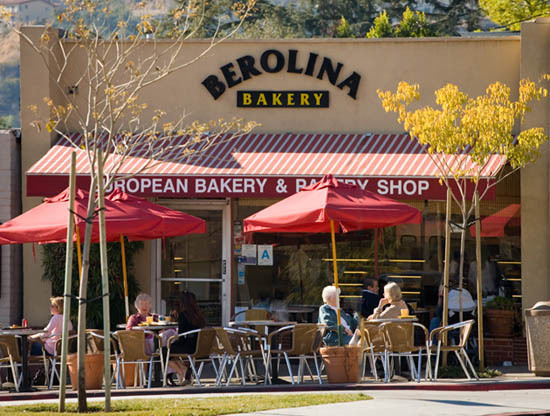 Berolina Bakery originally opened in the 1960s, and was purchased by Anders and Youna Karlsson in 1991, at which time the updated the entire operation. “We replaced everything in the kitchen, except for maybe that fridge!” says Anders, pointing to a large refrigerator holding the bakery’s specialty cakes: Princess Cakes. Originally from Sweden, Anders says his primary motivation for moving here was the weather. “I was working at a McDonald’s and then got offered a position as a bakery apprentice,” he says. “The 4 a.m. start times were hard, especially because in Sweden it is very cold most of the time, but I got used to it.” The weather in Southern California is, obviously, milder. As owner of Berolina Bakery, Anders has arranged his schedule so that he starts work mid-day, which is a better fit for him. His wife and co-owner Youna, who is originally from Belgium, takes the morning shift. “This is a bakery, so there is someone here 24 hours a day,” he says. Berolina Bakery is first and foremost a bakery, but that delicious bread makes a great sandwich, so it does a brisk café business as well. In addition to sandwiches and Panini, the bakery’s café also offers salads along with a delicious selection of European pastries and gourmet coffee. Berolina Bakery recently added Belgium waffles to its Friday and Saturday breakfast menu, which has been a big hit. The restaurant has been serving breakfast and lunch for many years, but about 3 years ago, the city of Glendale widened the sidewalk, which allowed Berolina Bakery to add about 10 tables and greatly expand its serving capacity. 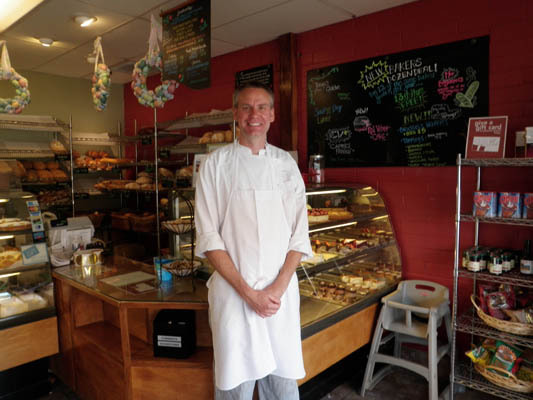 Anders says that the best part of owning Berolina Bakery is the freedom of being an entrepreneur. The bakery and restaurant are closed on Sunday and Monday, which allows Anders and Youna to have a (mostly) 5-day workweek. Of course, the flip side of ownership is that “you have to always be prepared for ‘the call’ when something goes wrong or someone needs something,” says Anders. With employees working around the clock, that call can come in at any time. Expansion plans focus mainly on selling the famous loaves of fresh-baked breads off-site. Berolina Bakery recently began selling bread at the Sierra Madre Farmer’s Market and will begin selling in Howie’s Ranch Market, an independent market in San Gabriel. Anders and Youna split marketing duties, with him responsible for Twitter and her managing the Facebook fan page. Anders estimates that he spends about 2 hours per week on Twitter. A Prinsesstårta (Princess Cake) is a traditional Swedish cake consisting of alternating layers of airy cake, thick pastry cream, and jam, all topped with a thick layer of marzipan. The marzipan overlay is normally green, sprinkled with powdered sugar, and decorated with a pink marzipan rose. Yum! This entry was posted on March 25, 2010 at 4:31 pm and is filed under Uncategorized. You can follow any responses to this entry through the RSS 2.0 feed. You can leave a response, or trackback from your own site.